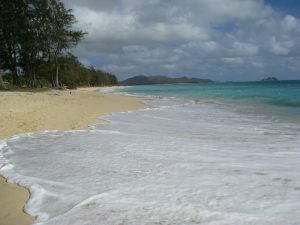 When I was a little girl, there was one beach that we always visited during our trips – Waimea Bay. I remember driving through the sugar cane fields for what seemed like hours to get to this beautiful bay on the North Shore of Oahu. There we would spend all day floating in the surf, basking in the sun, and snorkeling. Well, the last time I visited Waimea was sometime in the early 90’s. Other beaches claimed by allegiance and Waimea was just too far away. And so today, after a 15 year absence, I went back to my old beach. It was the first time both Kevin and the girls had ever been to the North Shore. It was still a long trip as we are staying on the southern tip of Oahu and Waimea is on the northern tip so we had to wake up so early and retain our sanity as the kids moaned “are we there yet?? ?” Once we got there, all moaning instantly stopped. It was just like I remembered. A beautiful blue bay with a huge stretch of sand. Now it was my girls floating in inner-tubes in the surf and spinning around and around. Leina figured out the joys of snorkeling and we had to drag her- literally!- out of the water. We checked for webbing between her toes but so far she hasn’t begun her transformation into fish yet. But really, it’s only a matter of time. But the best part? Well, when we arrived most of the beach was taken over by fishermen who were casting out along the shore. Us swimmers were regulated to the far edge of the bay because a large school of fish had taken shelter near the shoreline. The fishermen weren’t having much luck and things took a definite turn for the worse for them when a giant pod of spinner dolphins showed up. Yup, about 50 spinner dolphins swam into the bay, rounded up the fish, and started munching. Many of the fins were in sets of two and the lifeguard announced that this pod had many nursing young with their mothers and warned swimmers to stay away. The pod was so close, people were paddling out to swim with them! And the best part? Well, they call them spinner dolphins for a reason. I guess they enjoyed their meal because all of a sudden, they started jumping out of the water. Jumping, spinning in the air, and crashing back into the sea. It kind of reminded me of the fireworks display at Disney Land. Every time a dolphin launched into the air, the whole beach would erupt in ohhhhs and ahhhhs. It was beyond amazing. They stayed there for hours eating, swimming and spinning in the air. The fishermen were bummed but we were ecstatic. The only damper was when the lifeguard announced that this pod was often prey to “large predators” and that perhaps swimming among them was a very bad idea. Any romantic vision I had of frolicking with the wild dolphins quickly vanished and I clung nice and close to shore. We drove home the long way hugging the shore line all down the east side of the island. The kids slept while Kevin and I rubbernecked. This place is simply unreal as far as natural beauty goes. Every turn offered a new view to wow us. Perfect. Kevin’s favorite view? When we turned the corner into town and saw the Leonard’s malasada van parked in a mall lot. He practically grabbed the wheel to get me to pull over. Fool that I am, I let him order the malasadas and he returned a few minutes later with a sheepish look on his face and three boxes pilled in his arms. Yes, that would be 24 malasadas. Of course, the girls had their hearts set on shave ice so we stopped for some. As soon as we were done, we headed home to break into those malasada babies. So for dinner, I had a shave ice appetizer followed by three malasadas. One chocolate filled, one lilikoi filled and one haupia filled. I washed it all down with a cup of hot coffee and it was good. I must admit that as I picked up that last malasada I felt the slightest twinges of guilt pricking me. I knew I was going to pay for this indulgence later but I decided, what the heck! Pass the malasadas and put it on my tab. I’ll pay later. Once all 24 of these puppies have been finished off! This entry was posted in Hawaii on August 6, 2009 by Chrissie.